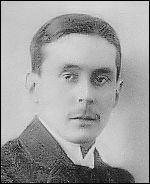 Korostovetz, Vladimir [Володимир Коростовець] – journalist, writer, active in political and community affairs; born on 16 July 1888 in Gatchina, Russia; died on 29 September 1953 in London, England, United Kingdom; buried in Kensal Green Cemetery, London. In his early years Korostovetz lived partly on the family estate at Peresazh near Chernihiv in northern Ukraine, and partly in St Petersburg, where his father was a colonel in the Russian imperial army. He was initially educated at home by a number of tutors, including an Englishman by the name of Brennan who had recently graduated from Oxford University. In about 1898 he enrolled at the main gymnasium secondary school in Kyiv. In 1906 he moved to St Petersburg where he completed his gymnasium education and began his studies at the University. In 1908 he transferred to the St Petersburg Polytechnic Institute where he completed his studies. From 1912 to 1917 he occupied a number of positions in the Russian Ministry for Foreign Affairs, including that of secretary to three foreign ministers. In November 1917 he returned to Peresazh where, in the anarchy which followed the Bolshevik revolution, he organised the defence of his family estate. In 1919 he fled with his wife to Warsaw where he worked as a foreign correspondent for a number of periodicals, including the New York World. In 1923 (or 1925) he moved to Berlin where he was an active member of the émigré hetmanite movement led by Pavlo Skoropadskyi, whom he knew from his early life in St Petersburg. He was a member of the executive committee of the hetmanite Ukrainian Union of Agrarians-Statists, and in 1926 played a key role in the establishment, at Skoropadskyi’s initiative, of the Ukrainian Scientific Institute in Berlin. While in Germany he continued his work as a journalist and also wrote a number of books in German. During the 1920s Korostovetz visited the United Kingdom on a number of occasions, most likely on behalf of the hetmanite movement. From 1928 to 1932 he was employed by Arthur Maundy Gregory to write articles on Ukraine for the Whitehall Gazette, which was owned by Gregory. Around 1930 he moved to London as Skoropadskyi’s official representative, with the aim of establishing contacts and raising money for the hetmanite movement. He became a member of the Council of the Anglo-Ukrainian Committee founded in 1931 by Gregory, and in 1932-34 was a contributor to the Committee’s periodical, The Investigator. At various times before the Second World War he gave lectures at such venues as the Bonar Law College at Ashridge House and the Royal Institute of International Affairs at Chatham House. During the war he was employed by the British Admiralty and lectured extensively on Soviet affairs to the British armed forces in the UK and in other countries. After the war Korostovetz became involved in the work undertaken by the Central Ukrainian Relief Bureau and the Association of Ukrainians in Great Britain (AUGB) to provide assistance to post-war Ukrainian immigrants to the UK. He was a member of the AUGB Governing Council (1948-1952), the AUGB Executive Committee (1949-1952) and the executive committee of the AUGB’s Relief Board for Ukrainian Students in Great Britain – KoDUS (1948-1952). In 1950-51 he gave a series of lectures in Canada and the USA at the invitation of the Canadian Institute of International Affairs. His publications include The Re-birth of Poland (London, 1928), Graf Witte, der Steuermann in der Not (Berlin, 1929), Quo Vadis Polonia (Paris, 1929), the autobiographical Seed and Harvest (London, 1931) and Europe in the Melting Pot (London, 1938).